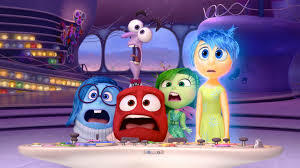 The other day the wife and I went to see the latest Disney/Pixar film, Inside Out. Our children are all grown up now so there was no need for us to see a kiddie flick, but serious minded Times columnist Melanie Phillips recommended it and that was excuse enough for me. As we've come to expect of Pixar. the film is a visually stunning spectacle, especially as we join Joy and Sadness on a trip around Riley's brain as they seek to recover her personality-forming core memories. Some great visual jokes as the characters transform into Picasso versions of themselves in the Abstract Thought sector. I won't spoil the plot for you by summarising it here. You'll have to look elsewhere for a proper film review. I'm not Barry Norman/Mark Kermode. Certainly not Claudia Winkleman. But the key message is that core memories, both happy and sad have a deep effect on our personalities. And that's what got me thinking. Joy keeps trying to cheer Riley up, as she's feeling out of sorts in her new environment. At all costs she wants to stop Sadness touching the girl's core memories. But it is only when Riley is allowed to feel sad that she realises how much she is loved and pulls back from doing something stupid. She's saved through sorrow. Kind of profound for a kids' film; the deep link between sadness and love. That works on a human level, but it also has theological resonance. God reveals the greatness of his love to us through the person of his Son. Jesus became a Man of sorrows and acquainted with grief in order to rescue us from the misery of sin. Surveying the wondrous Cross we reflect, 'Did e're such love and sorrow meet/or thorns compose so rich a crown?' Had the fall not have happened and all its tragic after effects, we would not have known the full depths of divine love for sin-ruined humanity. In the film Joy comes to learn the healing power of sympathy from Sadness. Jesus' continued love for us is disclosed in that even in his exalted state he is able to sympathise with his suffering people, Hebrews 4:15. See Thomas Goodwin's The Heart of Christ Towards Sinners on Earth. Some take the words of Revelation 21:4 'for the former things have passed away' to mean that the redeemed in glory will have no memory of sorrow, crying, or pain. But I don't think that's right. Jesus won't greet us with some kind of Men in Black memory wiping device when he gives us our resurrection bodies and welcomes us to the new creation. In John's vision it is the 'former things' that will pass away, not the memory of them. The saints in glory will remember their sins, sufferings and struggles. Were that not the case, how could they sing to the Lamb, 'you have redeemed us to God by your blood' (Revelation 5:9)? With no memory of former events they would have no comprehension of why they ever needed redemption, and would not therefore be moved to worship the Lamb for his saving work. Besides, as Inside Out suggests, our memories make us who we are, and there is continuity of personal identity for believers in their resurrection bodies. Grace does not destroy nature, but redeems, restores and perfects it. We will not be resurrected to a state amnesia. As Augustine reflects in the words at the top of this post, memory is mind and mind is me. In the glory even memories we would rather forget will not be obliterated, but will be understood in relation to God's purpose. Then and only then will we be able to grasp Romans 8:28 in its full wonder. The rich tapestry of our Father's wise and sovereign plan for our lives will be revealed with all its twists and turns, joys and sorrows. We will hear him say, 'I meant it for good', as he reaches out a fatherly hand to wipe away every tear from our faces. And a joy before unknown will fill our hearts.